Lindsay Lohan has revealed that, though she stands with women, she believes that the #MeToo and Time's Up movements make women look "weak" and that many women are coming forward with accusations for attention. Lohan's words are currently being picked apart on social media with many enraged at her thoughts on the situation. Actress Aisha Taylor says that Lohan should be "canceled forever" after her remarks, which is one of the nicer things that is being said about the former child actress. In a new interview, Lindsay Lohan admits that she's not a fan of the recent Time's Up and #MeToo movements. She indicates that she has never been the victim of sexual misconduct, and says that she supports victims, stating that everybody goes through things and deals with them differently. However, she did indicate that the movements make women look "weak". She had this to say. "I'm going to really hate myself for saying this, but I think by women speaking against all these things, it makes them look weak when they are very strong women... So, I don't really have anything to say. I can't speak on something I didn't live, right? I am very supportive of women. Everyone goes through their own experiences in their own ways." 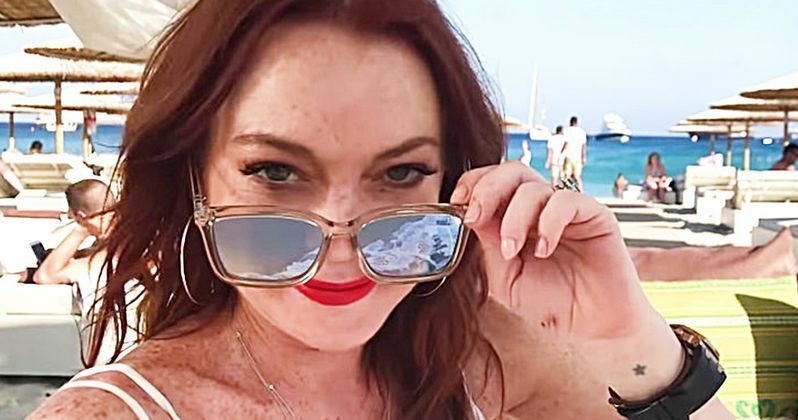 Additionally, Lindsay Lohan believes that women should come forward immediately after the incident instead of waiting, because it makes it look like everybody is looking for attention. As previously mentioned, Lohan has never gone through sexual abuse, so she really doesn't know what it's like, or how traumatizing it can be, or how it can jeopardize a career. The young actress believes that by waiting, you take away from the incident. She explains. "If it happens at that moment, you discuss it at that moment. You have these girls who come out, who don't even know who they are, who do it for the attention. That is taking away from the fact that it happened." In a now-deleted Instagram video from October of last year, Lindsay Lohan defended Harvey Weinstein's actions. She believed that all of the hate on Weinstein was going to keep others from speaking out and that it would end up harmful in the end, noting that she thought many of the accusation against Weinstein were false. The backlash was swift and intense, leading Lohan to quickly delete the video. Lindsay Lohan is quite popular on social media right now, but not for the attention that she probably wanted. However, the actress is entitled to her own opinion, no matter how many people disagree with her ideas about sexual misconduct in the entertainment industry. You can read the rest of Lohan's thoughts on the #MeToo and Time's movements over at The Times U.K. It entirely possible that she never thought that the interview would get any attention in the United States, but she was obviously pretty wrong about that.